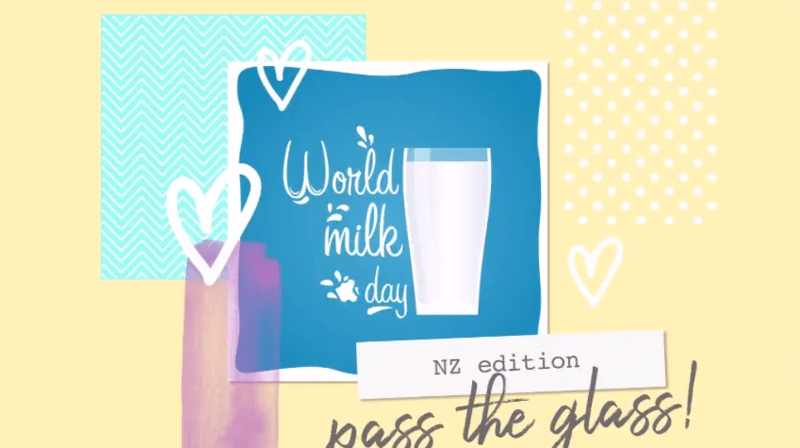 “Scandal” is the only word that describes the news that a NZ Food & Grocery Council video had failed to make the final cut of a world-wide competition to find the best videos to celebrate World Milk Day, June 1. The ‘Pass the Glass’ competition was run by FrieslandCampina NV, a dairy farmer cooperative/company in The Netherlands, and the chosen videos were to get pride of place on their YouTube channel. But alas, despite hours of planning and on-location production, FGC’s contribution was deemed not good enough, and the chance to share our celebration of the dairy industry that produces the purest and best-tasting milk on the globe was lost … or was it? Perhaps it was our sense of humour that didn’t make the grade (it couldn’t possibly be our production techniques! ), but we were nonetheless determined our efforts would not be in vain. Refusing to be accused of crying over spilt milk, or even having a sour taste in our mouth, we ruminated (even chewed our cud) for a short time before setting out to share our contribution with the world. This Director’s Cut compares a couple of the chosen entries with ours. And here we rest our case. Enjoy it with a cold glass of New Zealand milk (if you can find one – it’s a wonderful but rare thing!). You can check out some of the other “successful” entries on Friesland Campina’s YouTube channel. P.S. In case our use of the word scandal doesn’t translate terribly well into Dutch, our use is very “tongue in cheek” – oops, another idiom that might get lost in translation!